Weeks after the collapse of a dam in south-east Laos, SOS Children’s Villages is helping children whose families were displaced by the disaster and heavy monsoon rains. 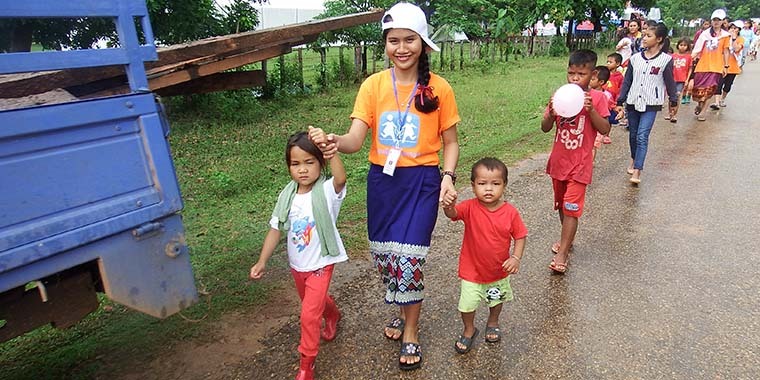 As one of the first organizations to respond following the July 23rd collapse of the Xe-Pian Xe-Namnoy dam, SOS Laos is providing food as well as recreational and educational activities at two child-care spaces in southern Attapeu Province. More than 13,000 people in 13 villages were affected and hundreds of homes were destroyed in the Sanamxay district. Dozens of people were reported killed or missing. In the following interview, Mr Dengchampa talks about the conditions and needs. What are the urgent needs of children? Every day we have more children coming to our two child-care spaces. More than 200 children are coming daily to our child-care spaces at the Sanamxay Secondary School and Mitsamphan Secondary School. We are very happy that more than 30 of the young people from our programs in Vientiane, Xieng Khuang, Savannakhet and Pakse have volunteered to help at the child-care spaces until their school starts. With the support of our colleagues from Nepal, which is very experienced in disaster response, we have trained them to help with the activities for the younger children. Our staff from Vientiane and Pakse are taking the lead in the response, and we are rotating teachers from other programs to provide educational activities for these children. But the children in these shelters need schools. Another challenge is that there is not enough food and water. The dam collapse, the release of water from other dams, and now the heavy rains have damaged infrastructure. Relief trucks cannot get to the camps and the capacity of the bridges can only handle small vehicles. We use cars to get as far as we can, then deliver food and other supplies to the child-care spaces by boat. Is there any sign of improvement in the conditions for those who have been displaced? Conditions are even worse than before. Some of the families who lost their homes are living on the road to escape high water. The shelters are on flat ground and flood easily. In some makeshift camps there are no spaces for cooking, and there are not enough toilets. There is not enough safe drinking water. The rainy season this year is very, very bad. From the north to the south of the country, the rivers are flooding. This has made the relief effort in Attapeu very difficult. How is this affecting the families who are displaced? The children are walking around because they have nothing to do. The fathers and mothers are trying to go back to their homes to see what is left. This is why the child-care spaces are so important – to provide activities and educational opportunities for the children and to make sure they are getting proper nutrition. Children are found to be more neglected, unattended and emotional. There is also a higher risk of violence against children. Children are playing outside in dirty water and mud, which raises the risk of water-borne disease. There is water and mud everywhere. The children need safe places to play and spend time, and where they can be safe. Many of these families grew rice or fish for their living. Their rice fields are now covered in mud, and even some of the fish farms are now mud. These families have lost their sources of income and food. In the shelters, they are getting rice and tinned fish, but there is a shortage of fresh vegetables. And again, safe drinking water is another problem. What more can be done to help in your emergency response? Because of the dam disaster, there are not enough schools for all the children. The damage reports say that around 13 schools were damaged or destroyed when the dam broke. We are also thinking about the longer run and what we can do help support these children so they can study until their communities and schools can be rebuilt. Families also need housing support. Local officials say it could take up to five years before homes for all the affected families can be constructed, partly because of the infrastructure challenges in the region.